Blizzard has unleashed a new StarCraft 2: Legacy of the Void website containing information about the game's cast of characters, new multiplayer features, three new trailers detailing multiplayer changes to the Terran, Zerg, and Protoss races, and a link to sign up for the beta. If the StarCraft story is your thing, there's a pile of single-player info on tap, including a groovy Oblivion trailer that promises an appropriately over-the-top conclusion to the StarCraft 2 series. It also serves up a nice breakdown of the game's central characters, including Hierarch Artanis, Rohana, Zeratul, Kerrigan, and Jim Raynor, and a look at the massive Protoss Arkship, Spear of Adun. But multiplayer is really where it's at, and there are a number of changes coming, including automated daily tournaments, the objective-based, open-ended co-op mode Allied Commanders, and Archon Mode, which puts control of a single base in the hands of two players as they go to war against two enemy forces. Each of the three races will also undergo some big changes for multiplayer with the addition of new units like the Terran Cyclone, the Protoss Disruptor, and the Zerg Ravager, as well as changes to existing ones. And the Lurker is back! 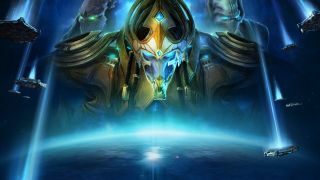 Blizzard confirmed that Legacy of the Void will be a standalone game, so experience in—or, more precisely, ownership of—the previous games won't be necessary. There's no hint of a release date at this point, but there is a link to sign up for the beta, which is "coming soon." See it all at LegacyOfTheVoid.com, or just watch the multiplayer trailers below.